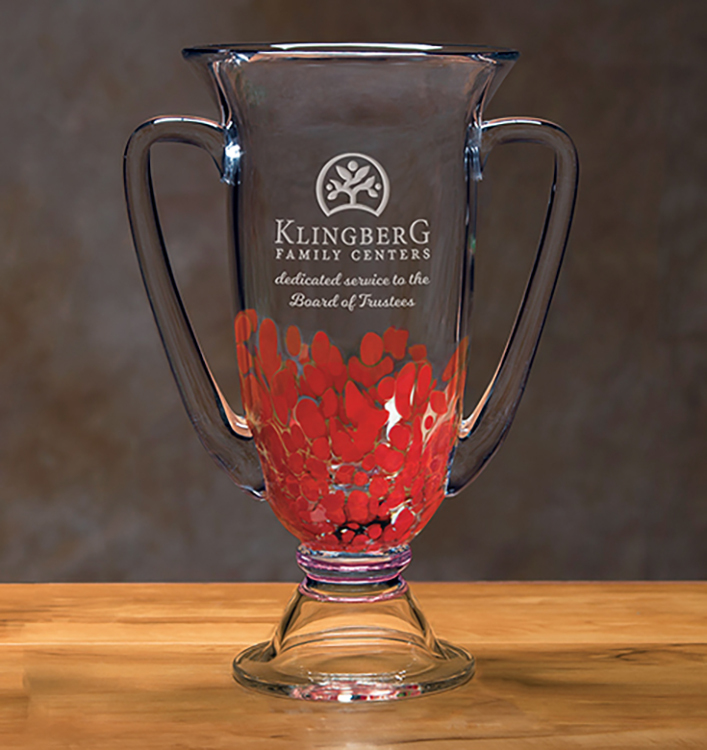 Our Reflection Vase makes a stunning gift for any recipient. 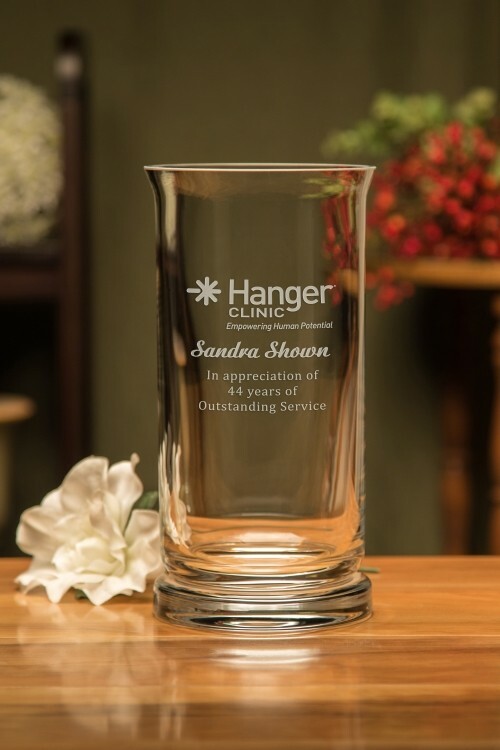 Its sleek contemporary design features an elegant flared rectangular shape. 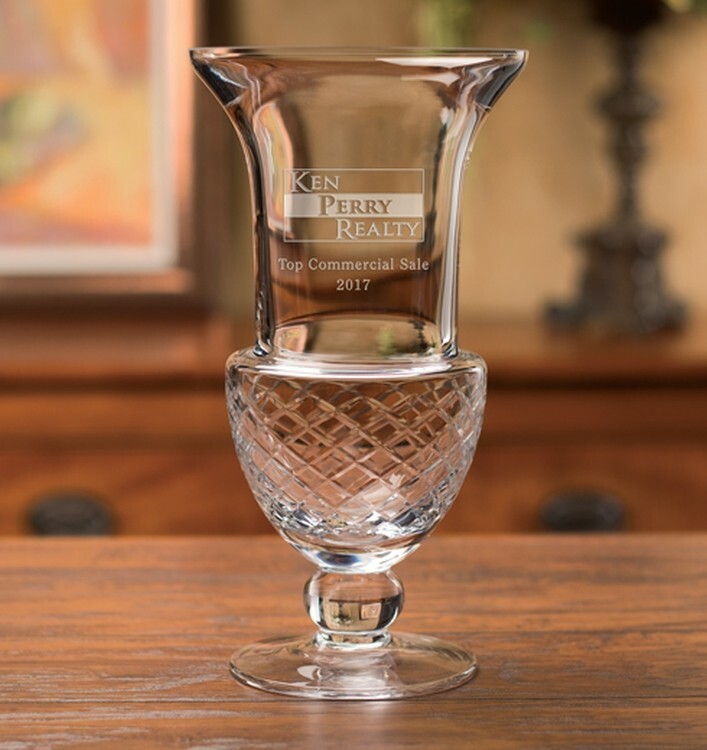 Crafted of non-lead crystal and available in two sizes, your personalized vase comes packaged in an attractive gift box for easy gifting. 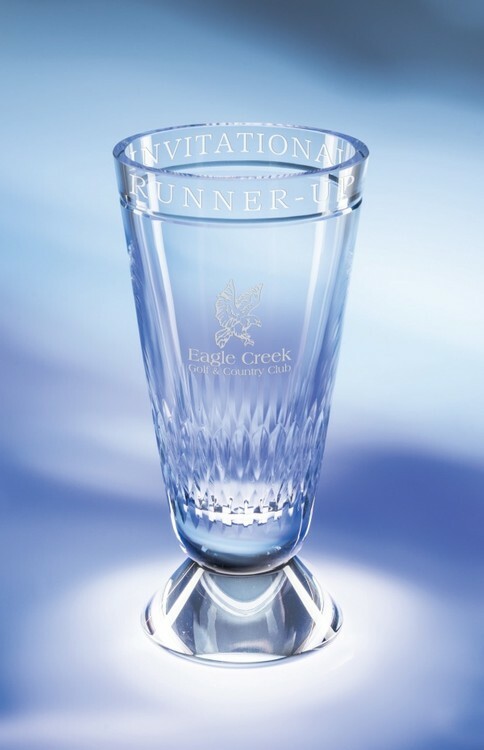 Etch area is 3 1/4"x2 3/4" for small award (10"Hx5"Wx3"D). 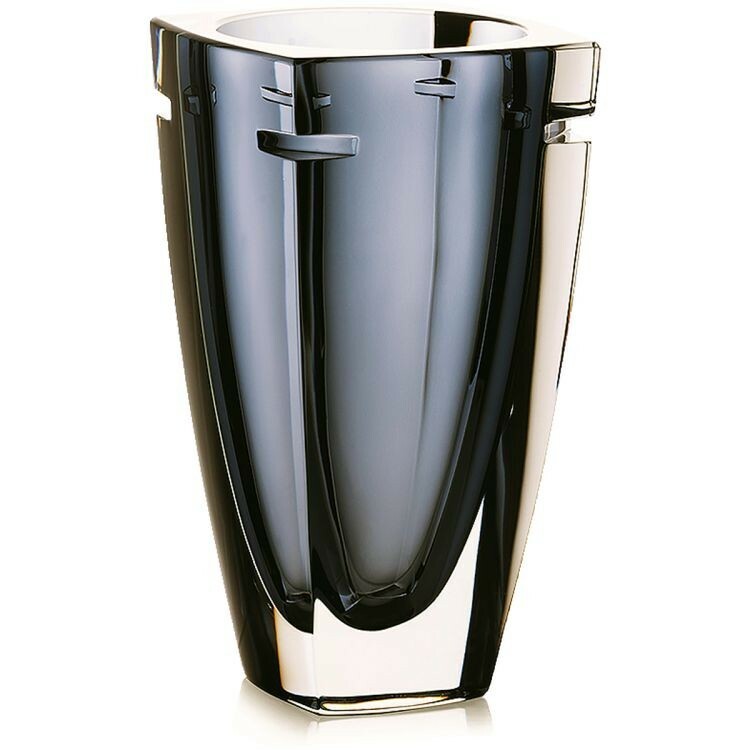 Hand-blown by skilled artisans and infused with a permanent layer of midnight blue crystal, our contemporary Glendale Vase features a unique flared design with a thick, sturdy base. 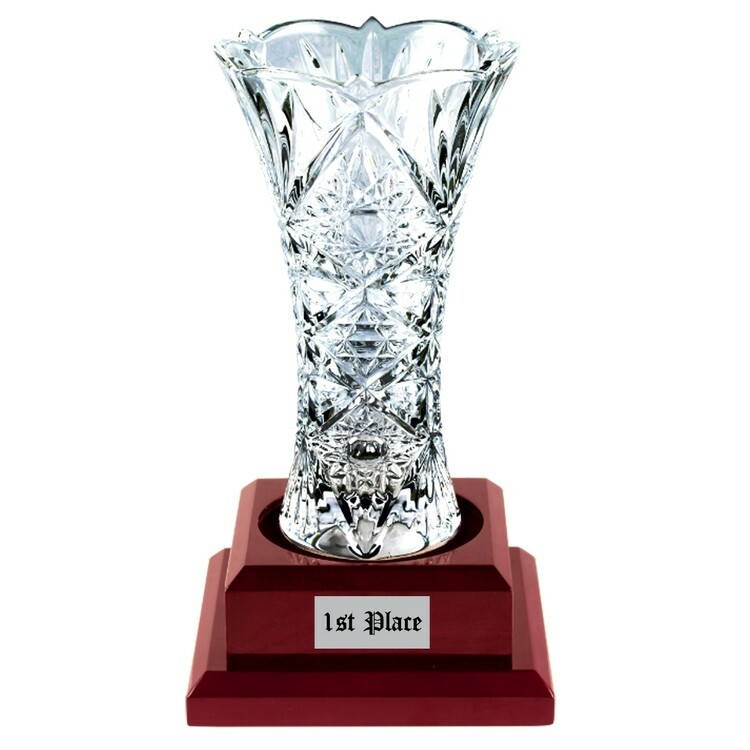 Available in three sizes and packaged in an attractive gift box, this elegant vase is the perfect way to promote success and achievement. 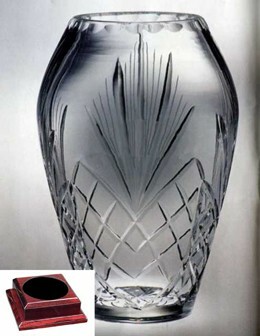 Etch area is 2 1/4"x 2 3/4" for medium vase (9"Hx6"W) and 2 1/4"x 2" for small vase (8"Hx6"W). 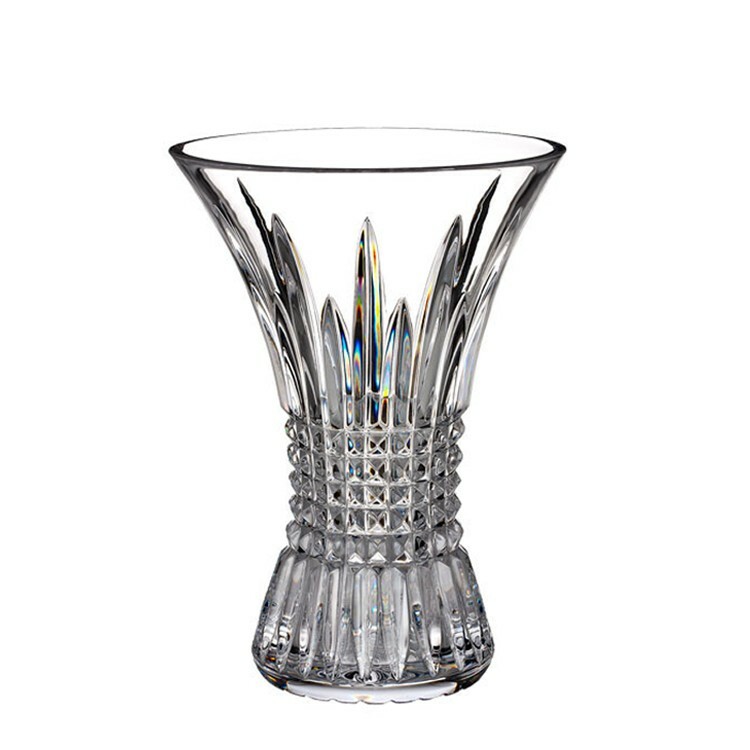 Hand-blown by skilled artisans, our contemporary Glendale Vase features a unique flared design with a thick, sturdy base. 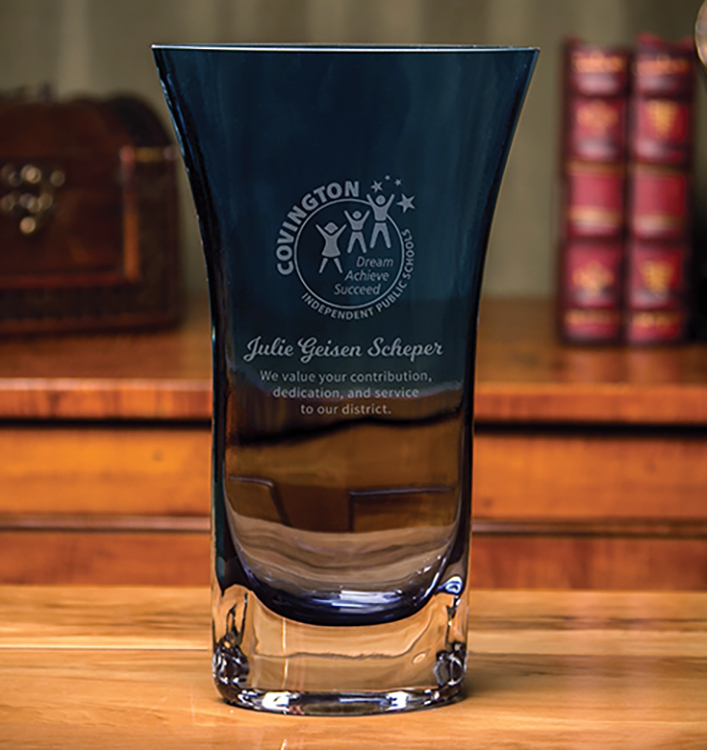 Available in three sizes and packaged in an attractive gift box, this elegant vase is the perfect way to promote success and achievement. 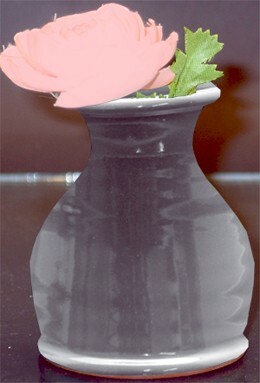 Etch area is 2 1/4"x2 1/2" for medium vase (9"Hx6"W) and 2"x2 1/4" for small vase (8"Hx6"W). 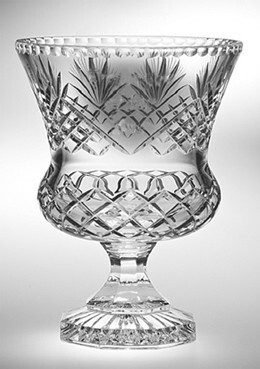 Raleigh Trumpet Vase-24% Full Lead Crystal. 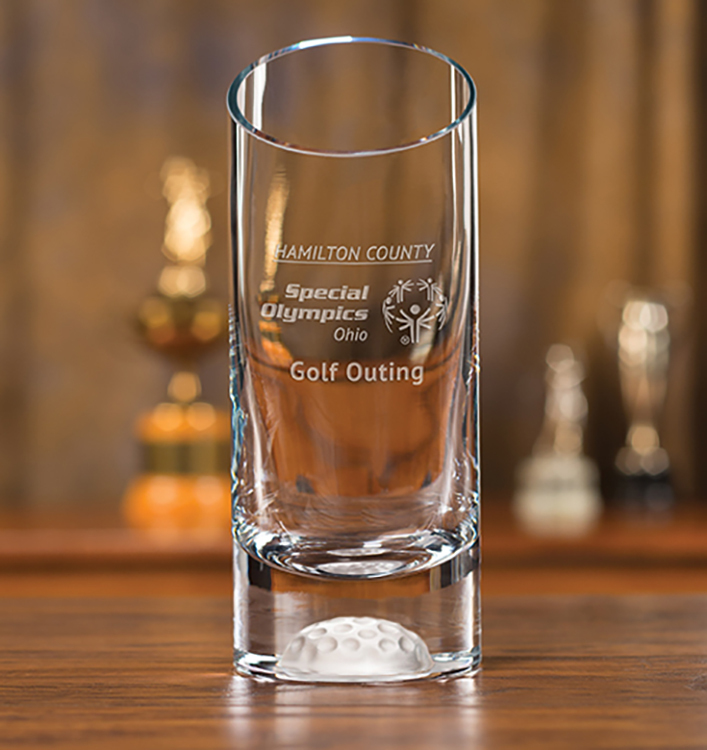 The Vantage Vase is a dramatic piece of hand-blown non-lead crystal designed with ample surface to showcase any corporate logo or award message. 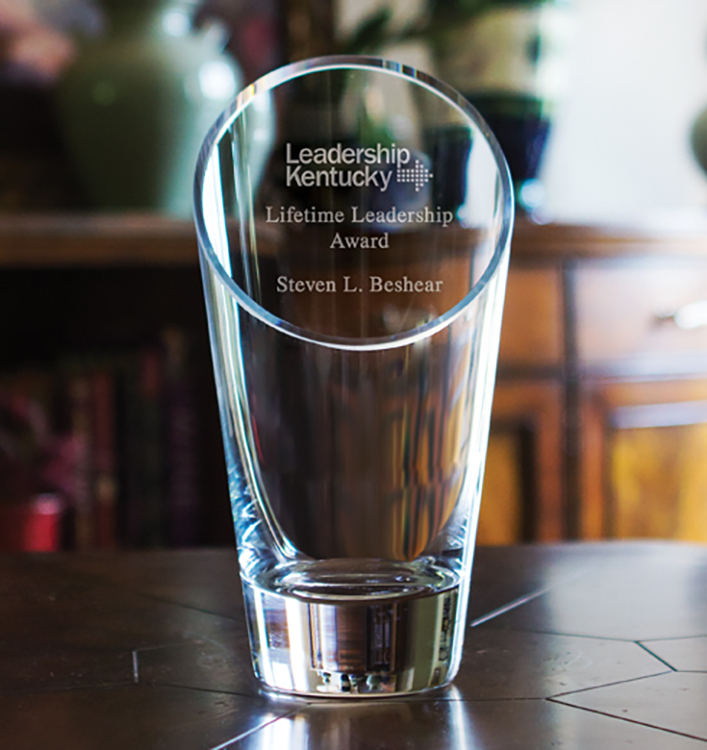 This piece employs reverse side etching for enhanced effect. Available in three sizes, each piece comes packaged in an attractive gilt box. 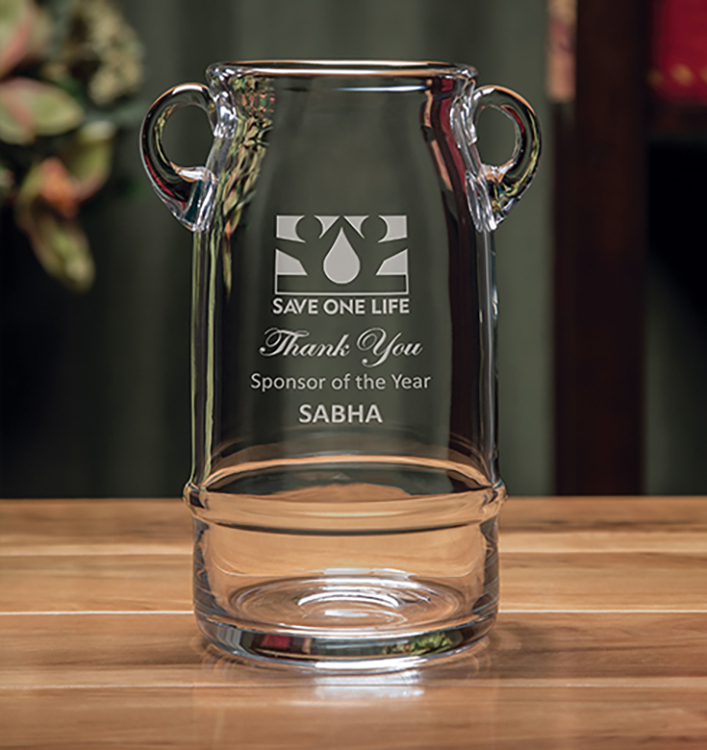 Etch area is 2 3/4"x2 3/4" for medium vase (9 3/4"Hx5"W) and 2 1/2"x2 1/2" for small vase (7 3/4"Hx5"W). 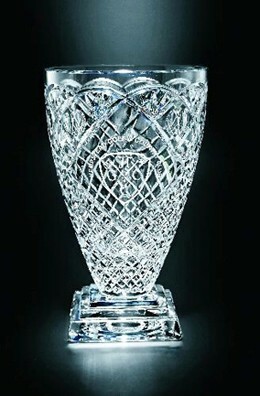 Raleigh Trophy Vase-24% Full Lead Crystal. 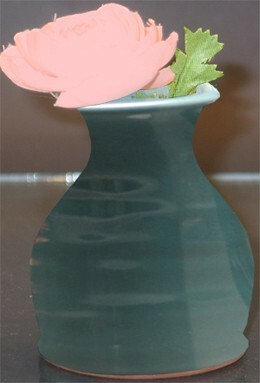 Raleigh Cintura Award Vase on Rosewood Piano Finish Base with 4-1/2"diam inset. 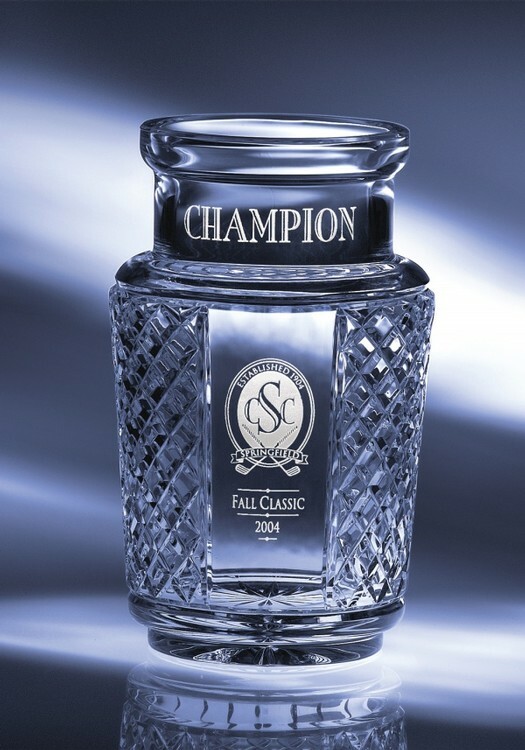 24% Full Lead Crystal.  Aluminum flash light key chain. Protractable section to double as a lantern to light up small work area. Carabiner clip attachment for ease of carry. 4XLR44 Button-cell battery included. 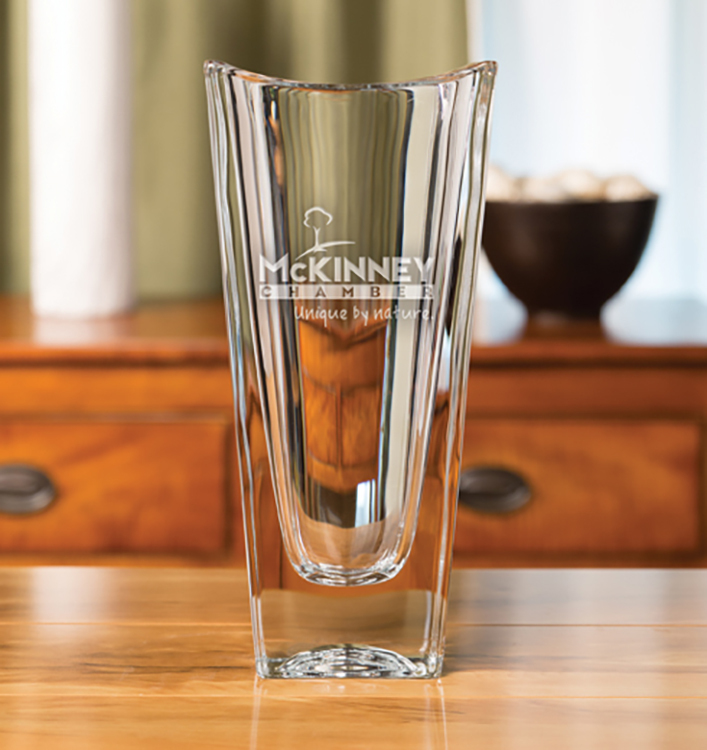 Our tall and impressive Exmoor Trophy is a great way to acknowledge a broad range of accomplishments. 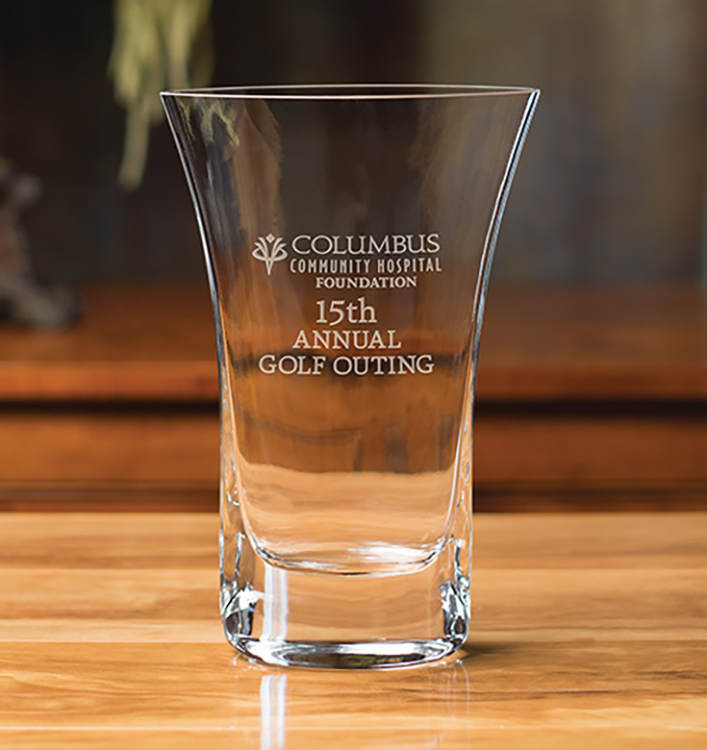 Made of fine-crafted hand-blown non-lead crystal and featuring a vase style with sleek hand-cut detailing, your elite award is available in three scaled sizes. 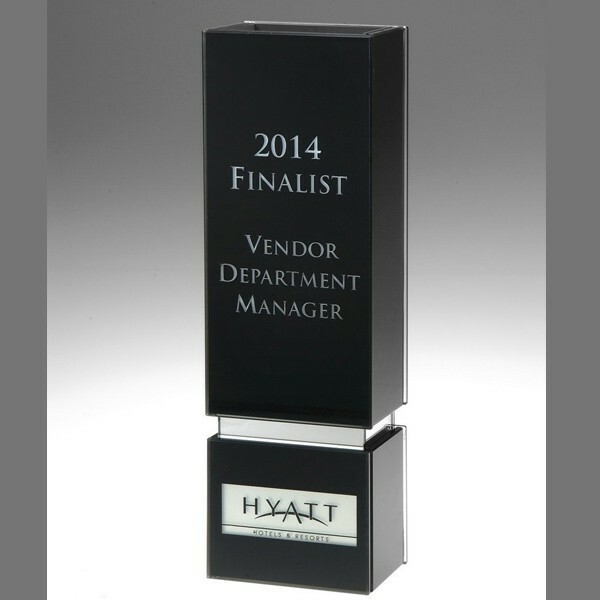 Etch area is 2 1/2"x2 1/2" for medium award (11"Hx5 3/4"W) and 1 3/4"x1 3/4" for small award (9 1/2"Hx5"W). 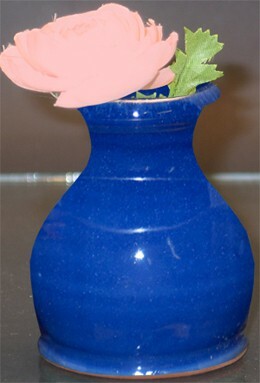 12.5" Royal II Glass Vase with Rosewood Finish Base. Each piece is handmade, so size may vary slightly. 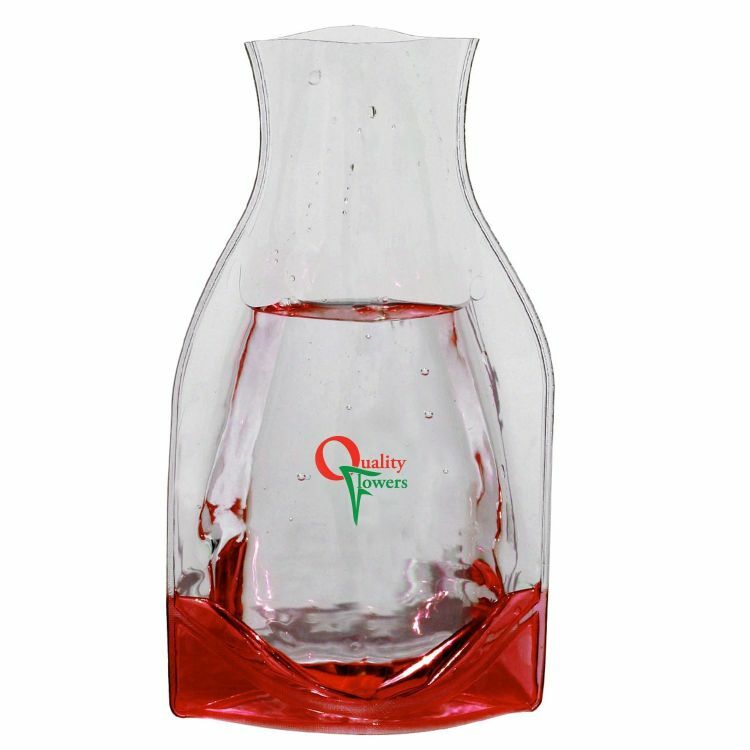 Vase and Wood Holder are shipped separately (Not Attached). The round insert area is felted and is 4.50" diameter and 1/8" deep. There is a 1/2" bevel around top the edges of each part of the base. Inspired by the deep oceans and clear skies of the Irish landscape, the W 7" Vase in Sky features an elliptical shape for a contemporary design. The rich color palette has a wonderful smokey tone that allows the other colors in the W collection to mix together beautifully. 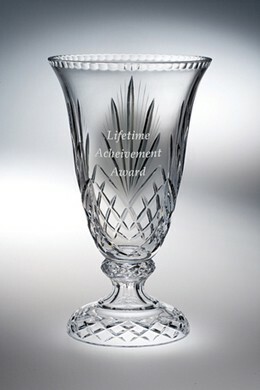 Oberhaum Award Vase. 24% Full Lead Crystal. 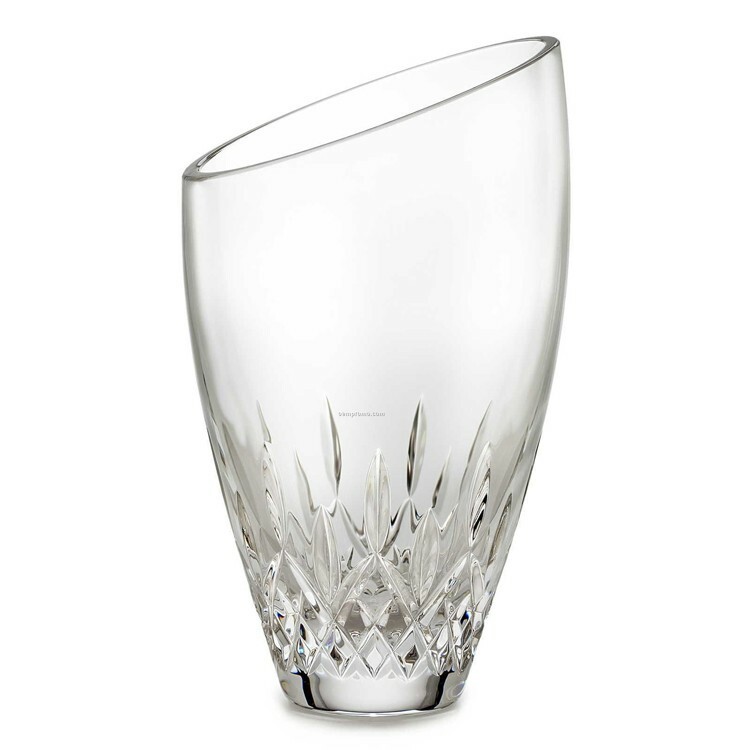 The Lismore Diamond pattern is a strikingly modern reinvention of the Waterford classic; characterized by intricate diamond cuts rendered in radiant fine crystal. 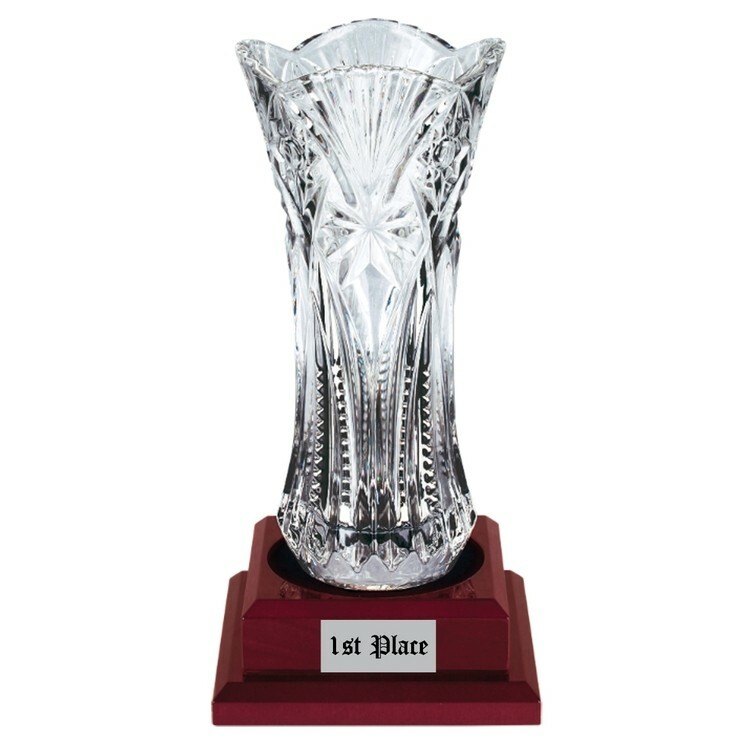 Perfect for displaying freshly picked flowers, or long stem roses, this Lismore Diamond 8" Vase showcases its contents beautifully; and features the weight and clarity for which Waterford has become world famous. 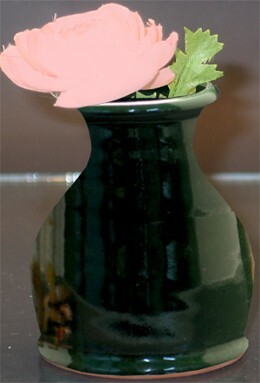 14.25" Royale Glass Vase with Rosewood Finish Base. Each piece is handmade, so size may vary slightly. Vase and Wood Holder are shipped separately (not attached) The round insert are is felted and is 5.50" diameter and 1/8" deep. There is a 1/2" bevel around the top of the base.